When it comes to homemade meals and treats, I’m a big fan of quick and easy recipes, because I don’t have hours of time to spend in the kitchen everyday. 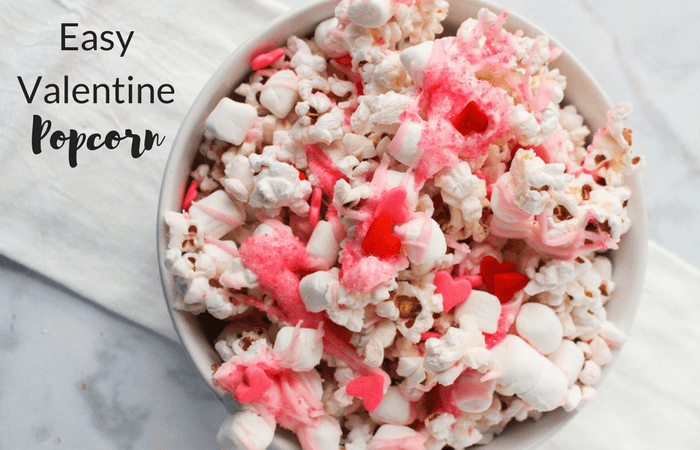 So when I came across this recipe for Easy Valentine’s Popcorn, I knew it would be a great treat to make for my kids this year. The only real cooking involved is using the microwave, which makes it super fast to put together. And the pretty results make it look like I spent a lot of time on this Valentine’s Day treat, when in reality, I only spent a few minutes. 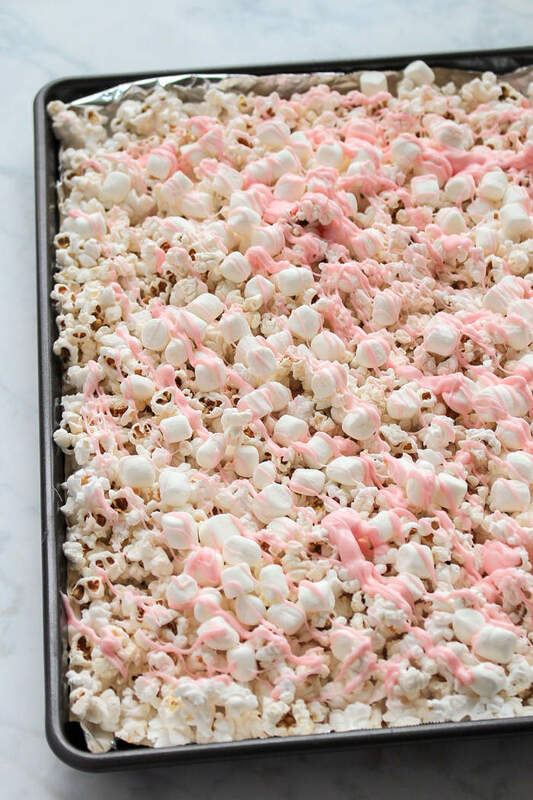 Not only is this a yummy snack for your family to munch on when they’re hungry, but it makes a great thing to pack up for Valentine’s parties at school. Just pack a bunch of it in individual bags, tie with a pretty ribbon, and you’ve got an inexpensive, unique party or Valentine gift. 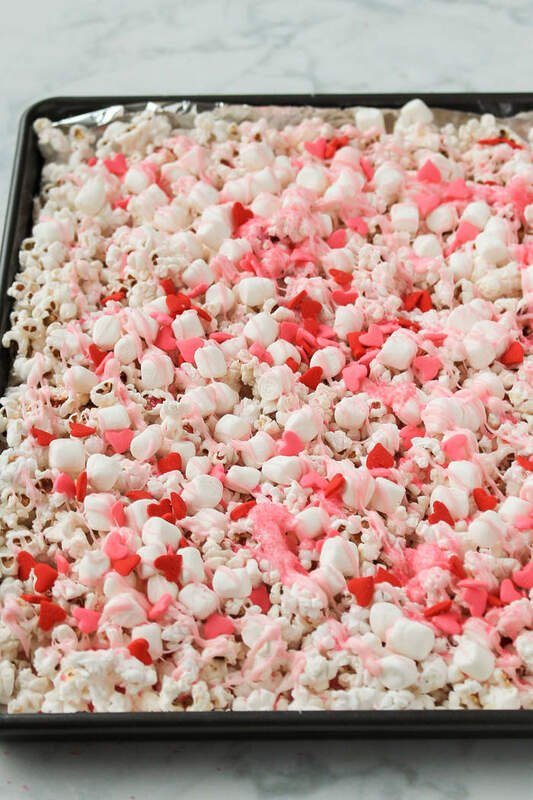 To get started, gather together your ingredients: unflavored popcorn (lightly salted is OK), pink candy melts, mini marshmallows and some pretty Valentine’s sprinkles. You’ll also need some vegetable oil (4 teaspoons). Begin by heating the candy melts in the microwave until the candy is fully melted, which takes about 2 minutes or so. Add the vegetable oil until the candy is thin enough to drizzle easily. 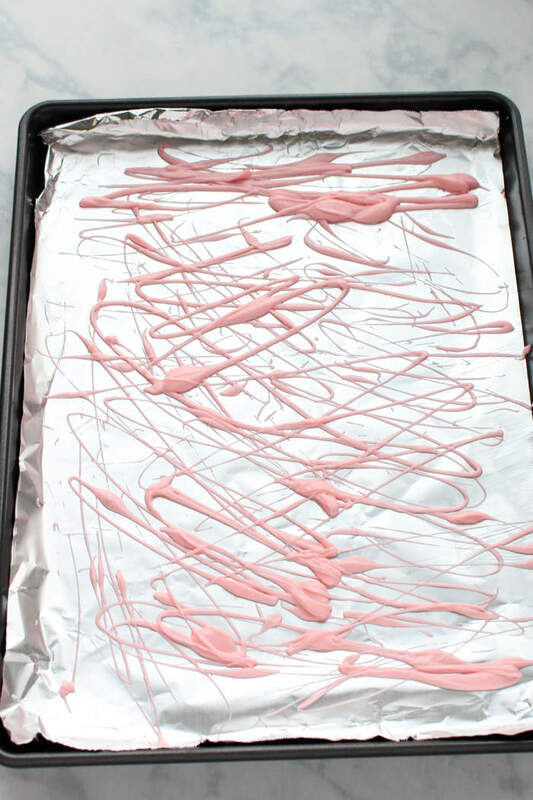 Drizzle a bit of the candy onto a foil-covered cookie sheet with a fork so that you have a good layer. 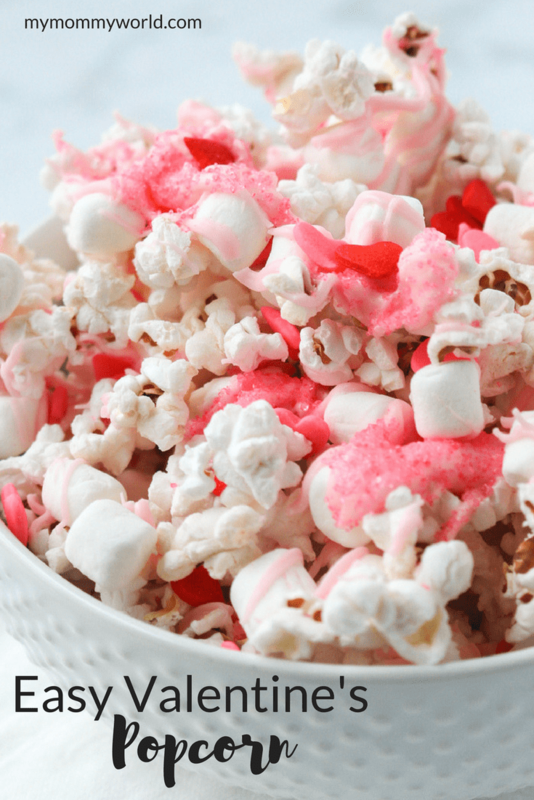 Layer the popcorn over top the candy, pressing lightly to make the popcorn stick into the drizzle. 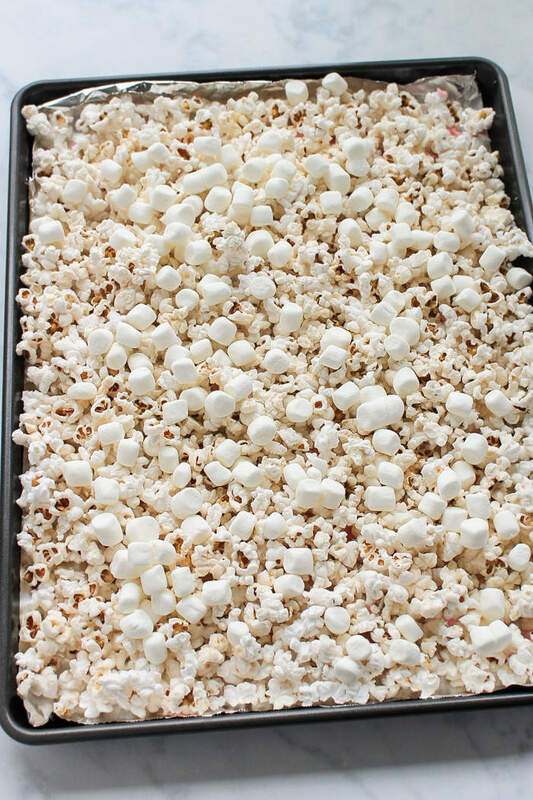 Sprinkle the marshmallows on top of the popcorn in an even layer. 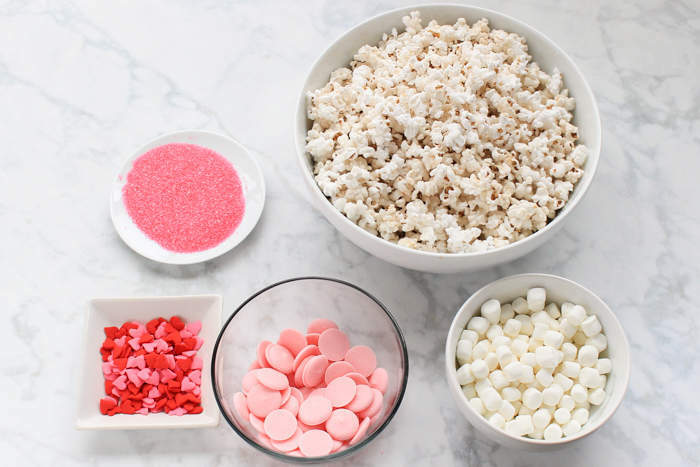 Pour the rest of the melted candy on top of the popcorn/marshmallows, then immediately sprinkle the top with the Valentine’s sprinkles so that they stick to the candy. Allow the popcorn to dry completely, until the candy has hardened. Scoop into a bowl, making sure to gather up the candy bits on the bottom of the pan. Microwave candy melts for about two minutes, or until fully melted, stirring every thirty seconds. Mix in vegetable oil, stir until thin enough to drizzle. Line a large cookie sheet with aluminum foil. Use a fork to drizzle a layer of chocolate onto the cookie sheet. Pour a thin layer of popcorn over top and press popcorn into chocolate. Top popcorn with marshmallows and drizzle remaining chocolate over top. Immediately top with sprinkles so the sprinkles can stick to the chocolate. Allow to dry completely. Then scoop popcorn into a large bowl, being sure to peel off the chocolate pieces at the bottom. Doesn’t this make a pretty Valentine’s treat? I love how easy it is, especially if I use pre-packaged popcorn! (I’m a big fan of Skinny Pop popcorn). It looks so festive and delicious too. Thanks for sharing! We had a snow day today, so was trying to find something fun to do and stumbled upon this! Super easy and very little mess! We bagged it up.for teacher Valentine gifts for tomorrow! Oh- and our store had little heart shaped marshmallows! It looks super cute! Yay Maggie! I’m so glad it worked out so well for you 🙂 The heart shaped marshmallows sound just perfect! I will really enjoy your Valentine Popcorn, it is a great treat! Hope you are having a great week and thanks so much for sharing your awesome recipe with us at Full Plate Thursday! I know we’ll be making this soon – thank you for the recipe and for sharing at last week’s Encouraging Hearts & Home blog hop!